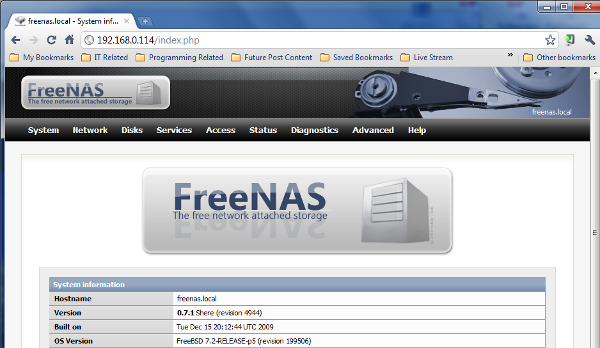 FreeNAS is available for download in two forms .ISO and .IMG. If all you want to do is try FreeNAS and possibly install then you should download the ISO. The .IMG is intended for embedded installs like the kind of install you do in USB flash drive or compact flash card. The thing about the embedded install is that unlike the .ISO the .IMG file includes no installer. Instead the user is expected to make use of third party tools to complete the installation. Nix* users have DD to write images, in the case of Windows the closest tool available is physdiskwrite. With physdiskwrite we can write the raw image to the storage media. Physdiskwrite is a command line tool, I will try my best to guide you trugh the commands. At the time of this tutorial the latest release for i386 is FreeNAS-i386-embedded-0.7.2.5543.img. I recommend following the Diskpart steps below to avoid errors that may come up when writing the image. The steps below will clear the drive you intend to use for the installation. For the sake of simplicity I recommend placing both Physdiskwrite.exe and FreeNAS-i386-embedded-x.x.x.xxxx.img in the same folder. The output above tells us that PhysicalDrive3 is the removable drive. Which is why we select drive number 3 to write the image to. Confirm you want to overwrite by typing Y. Once the process is done close the terminal window. The image is now in the Flash drive. Keep in mind that in order to boot from a Flash drive you need to set the BIOS to boot from removable media. es hora del duelooo ! This worked for me. I used the GUI, but it must be started it in “Administrator” mode. Also, I selected the 2GB option, not sure what that was about. © 2019 Linhost.info. All rights reserved.